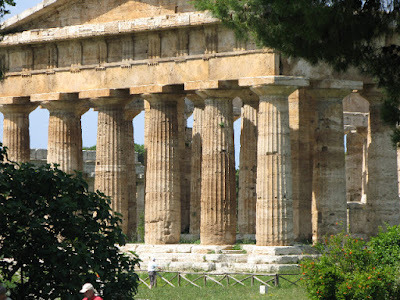 Ruins are an essential part of any trip to Italy but we can stop looking now because a few days ago we visited Paestum, and they don't get much better. 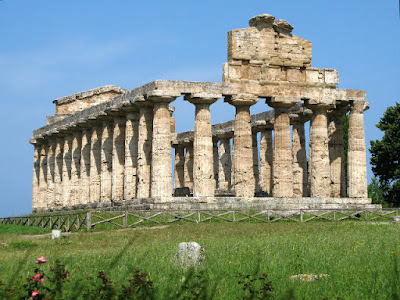 I’m ashamed to say it’s a site of which I had not heard though it has three of the most complete Greek temples extant. Though every guidebook I looked at attributed the three temples to a different diety, the majority claimed the two largest for Hera, and the smallest for Athena. Since I always prefer goddesses to gods I’ll leave it at that. Like many of the sites we saw in Turkey, this town, called Poseidonia by the Greeks, eventually fell victim to the silting of its river and the influx of malaria-bearing mosquitos. 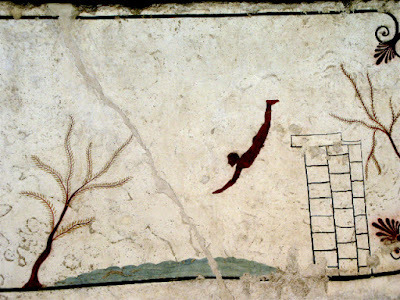 The residents—Romans by then—moved to the mountains and left Poseidonia to fend for itself. Covered by dense vegetation, it was not rediscovered until 1770. The photos below do not do justice to the structures, they were massive and weighty and worthy of housing a goddess. 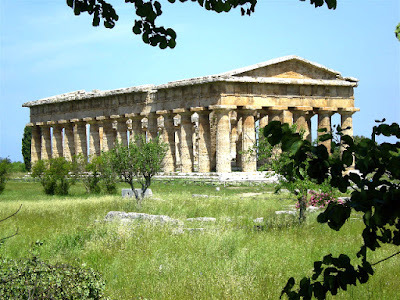 Camping near Paestum was the best so far in Italy, where camping has generally not been pleasant; a large shady field and clean, modern facilities that worked most of the time. There was a large pool being repaired, a market being stocked, and a bar serving a limited selection of drinks. This is the curse of traveling out of season. The curse of traveling in season, however, is worse. 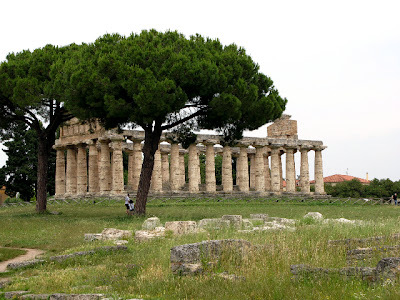 Within a few days the rain joined us in Paestum, so we headed across the Apennines to the east coast, and we’re now camped in a “holiday village” adjacent to the Adriatic Sea, between Bari and Brindisi. This campground, like most along the French and Italian coasts, consists of row upon row of permanent caravans (trailers), each with its own attached tent. The owners use these as weekend retreats and vacation homes, and they’re often equipped with extra “kitchen tents” containing full-sized refrigerators and stoves. Add a barbeque, a few lounge chairs, a large table, maybe a portable washing machine, some potted plants, a TV, lights, sound, and voila, you are at home. For the transient camper, like us, these are odd places to be. We are an after-thought, squeezed in among the caravans. On the north coast we stayed at two such places that were dark, empty, and crumbling—a taste of On the Beach. When we arrived here on Sunday the place was bustling with families. Today most have returned to their week-day jobs and only a few retired folks and their grandchildren remain. This is our second campground on this coast. The first kept us awake until 4 a.m. with disco music so we moved north to this one, which is better managed and cleaner. No discos, we were told, but no one mentioned the game show, or whatever it was, that began with a good deal of yelling on a mic at 10 p.m. and went on for a couple of hours. If I sound tired, it’s because I am. The weather, however, is perfect; hot sunny days and cool nights and there’s plenty of good Italian cheese, salami and wine to keep us going. Two jetons secure a full five minutes of hot water in the shower. And we’re told that if we drive about 30 kilometers to a small mountain town—without getting lost—we will find an Internet point that will be open after 5 p.m. today. If you’re reading this it means we did.